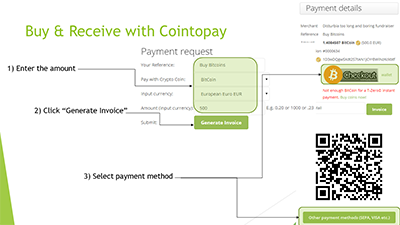 Cointopay International B.V. is providing crypto payment and web wallet services. You can make and receive payments, but also offer your goods on the crypto market without the need to setup your own shopping cart. We are integrated with the banking system for payouts. Take full advantage now. We offer one payment model: Pay 1% + network fee. For that you get free support and free plugins. For more information please check out the terms page. You can buy crypto currencies like BitCoin from us directly into your wallet. Sign up, go to your dashboard, generate an invoice then pay it via other payment options. 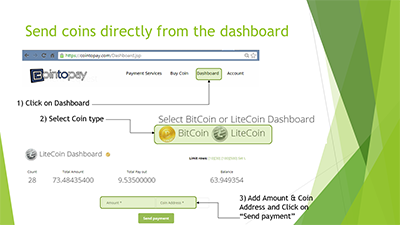 Once completed your coins will directly show up into your dashboard. Ready for sending! Please note that the input currency has to be set to Euro, US Dollar or Canadian Dollar for the alternative payment button to appear. You are basically invoicing yourself. Our really easy API (REAPI)&COPY; functionality allows you to further integrates into your backend system. 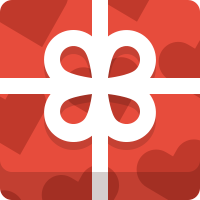 Generate and Integrate donation and fundraiser buttons with your online activities. Send us an email at: [email protected] in case of help required. The secure Cointopay.com/MerchantAPI?Checkout=true is the main shopping cart checkout system.It is able to generate invoices dynamically. The Invoice is shown afterwards. Checkout: set to true is always required in the URL, since that is the functionality we provide! MerchantID: Register an account on Cointopay.com, the MerchantID is automatically generated and can found in your account (after login). SecurityCode: The unique code is to identify the Merchant. It can be found in your account (after login). Amount: The amount for the crypto currency selected that needs to be transferred to you the Merchant. 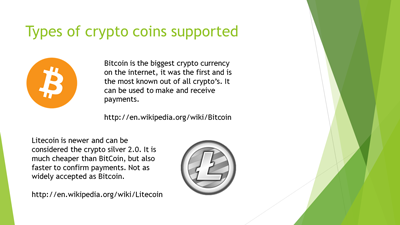 AltCoinID: 1 for BitCoin, 2 for LiteCoin, 8 for Dash, 9 for DogeCoin, 10 for BlackCoin, 11 for CannabisCoin and 12 for MegaCoin. More Coins are constantly being amended..
CustomerReferenceNr: Your shopping cart order reference number. It will be sent back to the TransactionConfirmURL as mentioned in your account details. 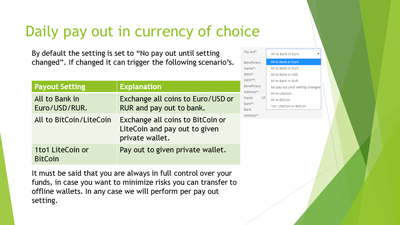 inputCurrency: Check out Amount in EUR, USD, GBP, CAD or RUR, the AltCoinID specifies the target currency. hasaddress: is set to 1 if you want to provide billing details like: billingfirstname,billinglastname,billingorg,billingphone,billingskype,billingemail,billingaddress,billingpostalcode,billingcity and billingcounty. output:can be set to json if required. Otherwise leave empty. TransactionID: Generated by the MerchantAPI. 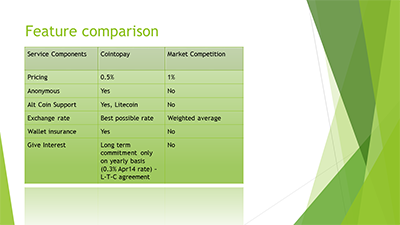 It is the reference point from the Cointopay transaction system. coinAddress: Generated by the MerchantAPI, no need to set it. It will constantly change for security reasons. ConfirmCode: Strictly speaking not required, this is for the absolute paranoia, the input you generated for your orders can be verified using the ConfirmCode. Let us know and we send you the work instruction. Furthermore you may use post or get, the end result is the same: an end customer INVOICE page. All data in transit/at rest goes via SSL/HTTPS/AES Encryption to/from the Cointopay back office. Generated links and forms are available after registration. If your interest is to accept crypto's it is required to register for a free Cointopay account before you can integrate your site with the really easy API (REAPI)&COPY;. Do you want to Accept BitCoin payments? Do you want to integrate with your shopping cart check out system? It will take less than a day with our technical full support service. The registration does not require personal identification, we can start straight away. See Backend integration support section. If you have some HTML background you just need to copy the script onto your website, but if required we assist you and/or your technical team with the setup of the back-office integration to support BitCoin and AltCoin payments directly. No long and tedious programming effort required. 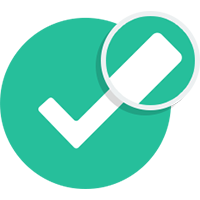 Once integrated in your site we always recommend a good test to validate the process end to end, this largely depends on your website setup. Cointopay payment processing will take over from the moment of checkout and return back the customer back to you once payment is confirmed by the network. The confirmation happens via a redirect, otherwise our payment checker will pick up the payment automatically. You will get notified by mail instantly. The Go-Live preparations are the most exciting, all done and tested, ready to roll. During go-live we will be on hot standby so we can jump in in case of any assistance required. Please inform us on your plans in advance. During the go-live customers will see the checkout buttons on your website and will be able to make payments crypto currencies like BitCoin. The customer will check out the amount in USD/EUR/RUR/CAD/LTC/BTC and we translate it into the Crypto equivalent, we work with the most accurate exchange rates. During the business as usual area you can check the payment status via our dashboard and in case of any questions. You know where to find us! Every day we will pay out according to the required pay out option. If needed we can perform an emergency pay out on the fly. You have full control over your dashboard. The possibilities are endless, low fees and fast transaction speeds offer endless possibilities for e-commerce shops of all kind. You can save up to 9% on your payment processing using BitCoin as a payment layer. You can generate an invoice directly in your physical shop via a tablet and/or smartphone and allow your customer to scan the QR code. Once the payment is received you get notified automatically confirming the payment, no insecurity: it is done. Enable your shopping cart for Crypto Coins as easy as that and benefit right now. Doesn't matter what shop you operate, or what mobile device you use. Crypto Coin payments are possible on a wide variety of devices and fully validated with the online Crypto Coin ledger. For all your invoices we validate if the payment has been made and update your dashboard accordingly. For T-Zero payments this is real-time, for Crypto Coin wallet this can take a couple of minutes.